WDR Funkhaus, Koeln, Germany, March 13, 1977. Marion Brown might be better known as the saxophonist on John Coltrane's Ascension but he is not only a highly regarded musician, he is a noted academic as well. Music reviewer Michael Stack calls the ethnomusicologist "one of the more unrecognized musicians in the New Thing movement." 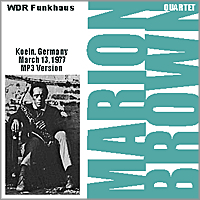 For those who are unfamiliar, this 1977 Koeln concert is a fine introduction to the Marion Brown Quartet. Ideal for late-night listening with a smouldering build-up, it is only on the final track that everyone lets rip. Guitarist Brandon Ross, who has worked with a range of talents that include Archie Shepp, Bill Laswell and Arrested Development, sounds uncannily like Pat Metheny on certain tracks. 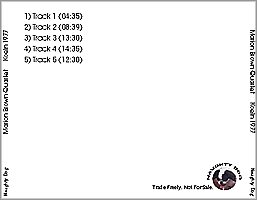 Thanks to blackforest who shared this FM recording on the internet. Click here to order Marion Brown albums.